Probably at the Exposition des Artistes Indépendants, Paris, 1934, either no. 2662 or 2663. Abstraction in Europe in the first part of the 20thcentury took many forms from Cubism to Vorticism, to Divisionism, Orphism, and Futurism. There were a number of remarkable individual artists who perfected personal abstract styles such as Hilma af Klint, Kandinsky, Klee, Malevitch, Delaunay, Mondrian, Gabo, and Kupka. The last of these, Kupka (1871-1957), who first went to Paris in 1899 was not a Cubist but rather inspired by Seurat’s theories of color contrast began experimenting with prismatic colors in disc form. About 1913 he produced what Alfred Barr described as “probably the first geometrical curvilinear and the first rectilinear pure-abstraction in modern art." He then became concerned with a theory of cosmic rhythm that he believed regulated both the stars and the sea, and this resulted in flowing but balanced abstract forms, such as in his Bleus mouvants(fig. 2a). In 1931 Kupka was a founding member of the group Abstraction-Créationdedicated to the recognition and dissemination of abstract art in counterbalance to Surrealism. 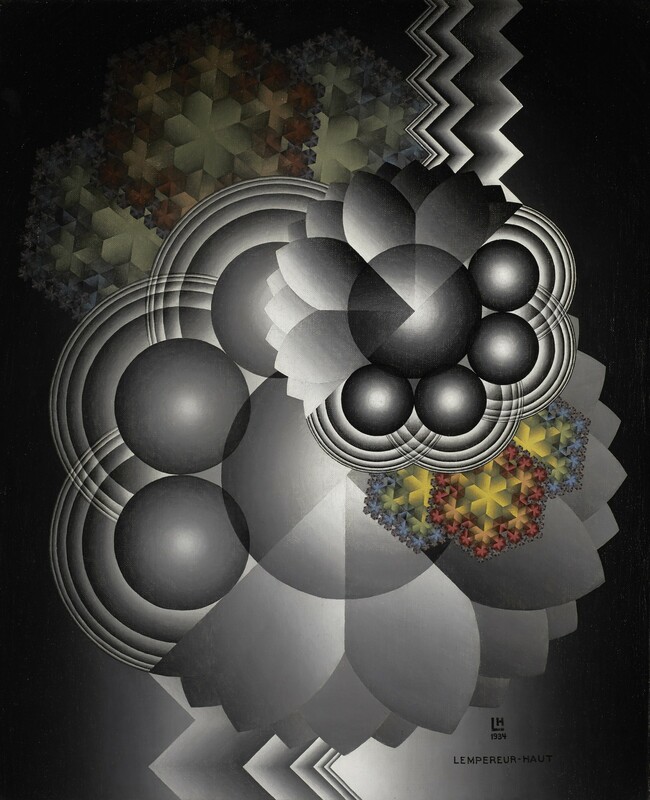 And in the 1930s he developed a version of abstraction employing the world of machines as the basis for his more geometric forms. In his paintings of this period, he distilled the contrast of circular and rectilinear elements into pure abstract compositions of great power (figs. 2b-d). Lempereur-Haut could not help but be impressed by such forceful works by his “friend,” but his was a more refined, lyrical style based on nature, and it also owed as much to one of the least well known abstract art movements, “Musicalism,” developed by the French painter Henry Valensi (1883-1960) in the late 1920s. This was codified by Valensi and several other artists into a movement in 1932 when they created the Association of Musical Artists, began a series of Musicalist Salons, and published a Manifesto. According to this artistic doctrine, these artists sought to synchronize color and form on their canvases in the way a musician arranges sonic matter in direct relation with the emotions they wish to express. While the theory may have been a bit abstruse, Valensi’s musically inspired works (Symphonies and Fugues) have a brilliant, prismatic, stained glass effect and are notable for often integrating natural forms, especially flowers, plants, and sometimes stars (figs. 3a- e). I play with geometric figures and they become what they wish. When I begin a painting, I do not know what it will become. I make many sketches and calculations. If it resembles something, I give it a title when it is finished. To make a painting, I proceed in a manner that is not typical of painters. I work like an industrial designer on white paper with my T-square, my compass, and my ruler. When I begin a painting, I do not know where it will go; there is no inspiration. But when I begin, it is already finished. Here, carefully constructed in dynamic, overlapping shapes, which, as the title, Flowers, suggests, the forms do create the image of abstracted blossoms. This motif occurs in other of the artist’s works of the 1930s (figs. 4c-d), but he also played with curlicues, hearts, stars, and colorful squiggles (figs. 4e-h). Gradually he abandoned such specific subjects for more generalized ones identified simply as Compositions(figs. 4i-l). Always he incorporated his LHmonogram prominently on the ground of these compositions. This painting is dated 1934, and an inscription on the back indicates that it was shown in an exhibition of La Socièté des Artistes Indépendants in Paris. In fact Lempereur-Haut did exhibit two works at that Salon, both titled Fleurs, and he did so again in 1936. It is impossible to say which works were shown on these occasions, but it seems safe to assume that this major painting was one of them.